Anger Management courses needed urgently. Thorny problem needs immediate resolution. Lack of interest leads to frustration. Apathy abounds! But who cares? 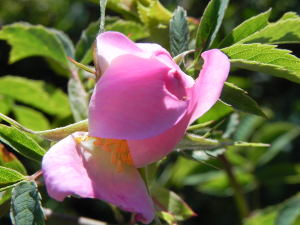 The wild roses are going – er, wild – in the hedgerows. Almost overnight it seems that every couple of yards there is the branch of a rose waving in the breeze – in some parts of the hedge they appear to have usurped the hawthorn and blackthorn totally and taken control of the solar energy supply. As you know, in a green environment , renewables are of maximum importance and securing the source of supply is vital – and it doesn’t matter whose toes – er roots you have to step on! The fruit of the rose, those red shiny hips that adorn the bushes in autumn, are said to be a source of vitamin C and have been collected and eaten for years. I can’t help but wonder, with a lot of these hedgerow berries, if people only ate them because there wasn’t anything else to eat. Because I have to say, apart from the delight of finding a free lunch, the inconvenience of collecting the fruit, the stings and scratches from plant and insect, in short the amount of effort that needs to be put in for a relatively small return, well, it doesn’t seem worth it really. Dr Edward Bach felt that an essence made from the Wild Rose flower would relieve apathy – maybe I should have a couple of drops. P.L.A.N.T strikes again! Bee Off!